I wonder what Chinese factory is making these things. They took a $5 baili razor, slapped their name on it, and are selling it for $40. Hopefully this thing doesn't turn out like the Parthenon. "An experienced wet shaver commented that The Emperor has already earned a permanent position in his rotation and can easily stack up against Gillette's legendary "Fatboy" or contemporary adjustable razors four times its price such as The Rex Supply Co's "Ambassador" or the Rockwell Model T.
I'm quite sure it stacks up well against the last one since hardly anybody has had their hands on one in about three years. It looks like REX had a love child with a Weishi and then turned to Delta Echo to hide everything. Stacking up against the Fatboy and Ambassador is quite a tall order. We shall see how much it goes for on Amazon once it is released. As far as which Chinese factory, Viking has been VERY open about their razors being manufactured in China, and hat it is to their specifications which are different from the Chinese razor that may look similar. We shall see who ends up selling them on Aliexpress shortly after. I'm thinking that Qshave and Weishi already got their Parthenon/Nostalgic tanking and Baili and Viking aren't talking to each other and so it might be Yintal or Yaqi. I own the crusader and it’s quite smooth and efficient. (01-24-2019, 01:47 AM)gLet Wrote: I own the crusader and it’s quite smooth and efficient. And that is what I was mentioning. The Crusader shares a lot of it's DNA with the Parthenon/Nostalgic, however folks are giving the Crusader good reviews and have been less sympathetic with the other two. It could be that either Qshave or Weishi will do an exclusive run of the Emperor just for Viking using a Viking design. I hope for the best with this razor as we all need more GOOD low cost adjustable razors. I agree with you, We all need more low cost adjustable razors. There are to many high end designs out of reach. Sheldon Cwinn is reproducing the Gillette classics and the Fat boy dubbed as the “Fat Guy”. I wouldn't touch a Vikings Blade product with a ten foot pole. (01-24-2019, 03:30 AM)gLet Wrote: I agree with you, We all need more low cost adjustable razors. There are to many high end designs out of reach. I saw that when I went over to order my $4 Challenger razor. I am not sure of his sources or anything like that, but apparently he is close to putting out a stainless steel Tech clone. Personally, as much as I want to see cheap adjustable razors, I am surprised that many are going the route of a TTO. I would think the three piece like the Variant and Progress would be easier to make, and then you have the latest ones like the Ascension where the only adjustment is to tighten or loosen the handle. I think they might be going the TTO vintage models is because of the mystique surrounding the Fatboy and the Slim. I for one am glad that they are producing TTO adjustable, but good TTO adjustable and not at high end market prices. DE shaving is only cost effective if you buy one razor and a brush. But most people don’t and spend more than a cartridge razor system. It’s like what the Japanese did with the Sony Walkman. Release new features ever other year and market it as “you got to have it”. How many people on this and other forums only own just one DE razor? I can guess ZERO. Artisans release new models and vintage replicas.....anyways I went way off track. I like the reissued vintage models and they shouldn’t be expensive. I do own a super adjustable and fatboy and they are smooth shavers. I own the crusader and it is equally as smooth for me anyway. I own a REX and that’s shaves well for me. 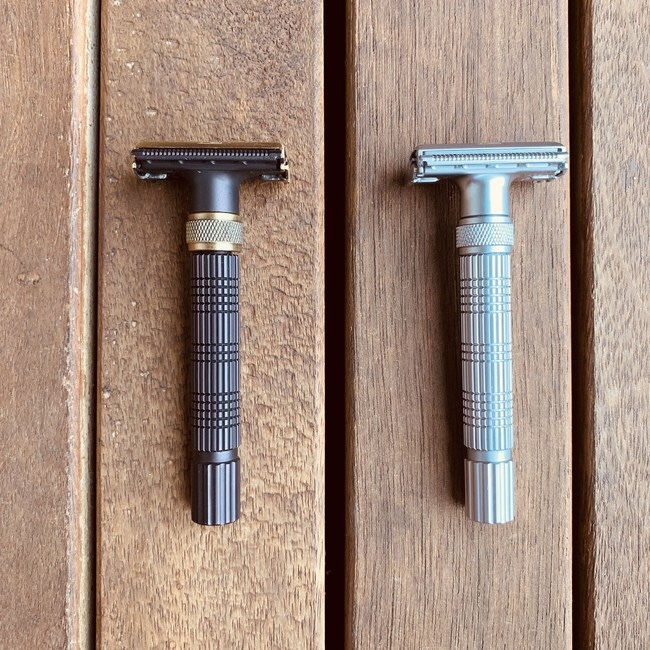 The Ascension is equally efficient and very cost effective for a stainless steel razor. There needs to be more innovation in wetshaving and less copying! (01-24-2019, 06:55 PM)gLet Wrote: I think they might be going the TTO vintage models is because of the mystique surrounding the Fatboy and the Slim. I for one am glad that they are producing TTO adjustable, but good TTO adjustable and not at high end market prices. That has yet to be seen though. Weishi/Qshave tried that with the Parthenon and failed miserably. Only the release will tell I guess.